Mix together raw cucumber and cabbage juices. Massage this mixture into the scalp and hair roots thoroughly for 10 - 15 minutes before going to bed. Leave on until morning. 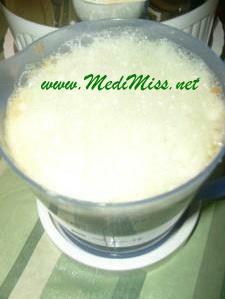 Raw cucumber juice and raw cabbage juice are rich in silicon and sulfur that stimulate hair growth and slow hair loss. In addition, raw cabbage juice is especially good for dry hair. It makes hair soft and shiny. If you enjoy drinking raw juice, you may also like to enhance the result with the following raw juice cocktail: mix together 80ml raw cucumber juice + 40ml raw cabbage juice + 80ml raw carrot juice. Drink raw juice everyday and get healthy beautiful hair! I like cucumbers, this sounds like a good recipe. Vitamins and nutrients are really important for hair growth. Thanks for the info!